A breakthrough discovery in communication for transforming love relationships Over and over couples consistently name improved communication as the greatest need in their relationships. 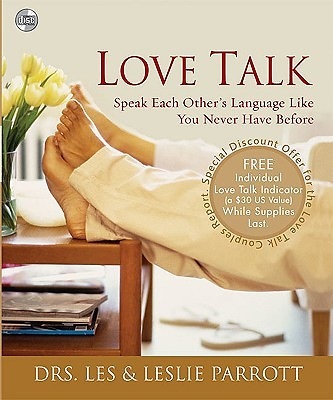 Love Talk--by acclaimed relationship experts Drs. Les and Leslie Parrott--is a deep yet simple plan full of new insights that will revolutionize communication in love relationships. The first steps to improving this single most important factor in any marriage or love relationship are to identify your fear factors and determine your personal communication styles, and then learn how the two of you can best interact. In this no-nonsense book, psychobabble is translated into easy-to-understand language that clearly teaches you what you need to do--and not do--for speaking each other's language like you never have before. assessment to help you determine your unique talk style *The Secret to Emotional Connection *Charts and sample conversations *The most important conversation you'll ever have *A short course on Communication 101 *Appendix on Practical Help for the Silent Partner Two softcover his and hers workbooks are full of lively exercises and enlightening self-tests that help couples apply what they are learning about communication directly to their relationships.